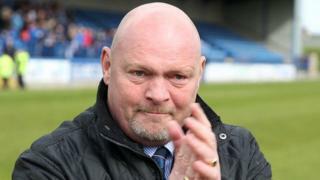 David Jeffrey ends his 17-year reign as Linfield manager with an emotion charged 5-2 win over Glenavon at Mourneview Park. Mark McAllister's goal was cancelled out by Tiarnan Mulvenna's equaliser before Ross Clarke and Peter Thompson netted before half-time. Thompson and Aaron Burns added further Blues goals before Andrew Hoey's reply.